There’s a style of apron for every homesteading chore and every budget. Pick a style that suits you and your needs best and I know you’ll love them just as much as I do. When one thinks of tools and work clothes for the homestead, aprons don’t usually come to mind, but they should. A good apron, like a good knife, is an essential homesteading tool. And like a knife, care should be taken to choose the right apron for the right job. “They want equal pay for equal work, and a chance at jobs traditionally reserved for men only. They seek nationwide abortion reform — ideally, free abortions on demand. They desire round-the-clock, state-supported child-care centers in order to cut the apron strings that confine mothers to unpaid domestic servitude at home. The most radical feminists want far more. Their eschatological aim is to topple the patriarchal system in which men by birthright control all of society’s levers of power — in government, industry, education, science, the arts.” (Emphasis mine). Aprons were now associated with domestic servitude and fell out of favor. It wasn’t until recent years that the apron has seen a revival. Today, there are many styles of aprons to choose from or can be made from scratch. Homesteading is messy work! In any given day, one could find themselves washing dishes, canning jams, feeding chickens and gathering eggs, gardening, constructing livestock shelters, or welding. An apron protects your clothes, keeps them clean, and can add an extra layer of protection for your own skin. But which is best for which job? Waist aprons tie around the waist, are typically of a lighter material, and serve to protect one’s clothing from the waist to either the mid-thigh or knee length. They can have pockets or not or be made with slot-type pockets for small tools. There are even waist aprons with specialized pockets (called Eggprons) for gathering eggs. Here is a pattern to make an eggpron with a pillowcase. Waist aprons are also the choice for the Hostess with the Mostest- adorable vintage or holiday themed waist aprons can be found on many online sites. 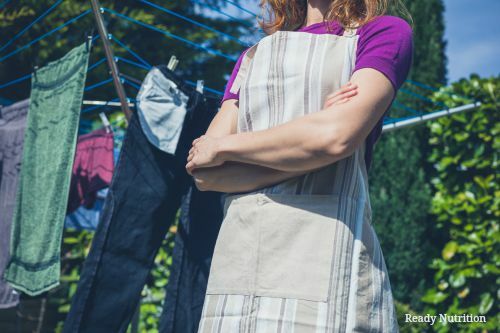 These aprons offer the most coverage for dirty household jobs. Pinafores are full-style aprons similar to what was worn ala “Little House on the Prairie”- full front coverage down to the knees (or lower), wide enough to wrap around behind, and secured with ties or buttons. The shoulder straps are wide like a sleeveless dress. Bib aprons still offer good coverage, but aren’t as constrictive. The lower portion is similar to a waist apron, but the front of the chest is covered by a bib (like bib coveralls). The top usually ties around the neck halter top style or can be buttoned behind the neck. The tied-behind-the-neck style can be adjusted for different torso lengths and bust sizes. Gardener’s aprons are designed to protect clothing while digging in dirt. Tin Cloth, made from “waxing” a durable canvas cloth similar to the cloth that Carhartt uses to make their jackets, is the original weather-resistant fabric. And it’s easy to make at home! For an excellent step-by-step instruction on how to make your own tin cloth apron, go here. If you have any of the tin cloth solution leftover, use it to wax backpacks, canvas jackets, reusable cloth totes…just about anything made of cloth that you would like water-proofed. The heavy-duty work horse of the homestead! If you’ve ever tried to trim hooves while holding a hoof between your knees, it’s easy to see why this is the apron of choice of farriers. These aprons should be worn for blacksmithing, welding, woodworking, and any other job on the homestead to protect your body from recalcitrant livestock or hand tools. Leather aprons come in both waist-style and bib style. A split-leg, chaps-style apron works best for farrier work. I am frugal if I am nothing else. I love saving money. The way I figure it, for every dollar saved, that’s less time I need to spend earning money and more time I can spend doing the things I truly love. By protecting my clothing, I don’t need to replace them as often and they stay presentable longer. I also don’t need to change my clothes as often during the day which generates less laundry and I love less laundry! If you’re new to starting your apron collection, thrift stores are a great place to find household aprons. Some of my best vintage aprons have come from second-hand stores. Aprons are also a great way to learn how to sew. Waist aprons are small enough projects to be sewn by hand. A quick search on Google for “apron patterns” will yield multiple links to free patterns. Don’t have the spare cash for material? No problem! Fresh Eggs Daily has an easy-to-follow tutorial on how to repurpose your feed bags into a waterproof, sturdy garden apron. Studio Kat Designs has a free pattern download to repurpose a pair of jeans into a waist style adult apron and Happy Hooligans has instructions on how to make a children’s craft apron out of denim pant’s legs. Missouri Star Quilt Company has a free pattern download for a Tea Towel apron pattern here. There’s a style of apron for every chore and every budget. I proudly display my favorite, functional aprons in my kitchen within easy reach whenever I need to put one on. There’s been more than once while canning especially stain-y fruits (stain-y is a word, right?) like blackberries that I was very glad I had my apron on. Pick a style that suits you and your needs best and I know you’ll love them just as much as I do. I was thinking about this as I was reading the article. Thrift store here I come! Mama-san aprons are fairly easy to construct, and offer full coverage! The shoulders go straight across, square neck as well, and the sleeves are simply part of the main body. The sleeves generally go only to above the elbow, and the body reaches to mid-thigh, usually. It ties at the neck and waist, in the back. Great excuse to use lovely fabric.